My new method of broadcast seeding is perfect for small autumn vegetables, but what about the big plants like cabbage and broccoli? I usually start three seeds per spot to make sure enough come up, then thin, but this year I was running low on seeds and only planted one per hole. The result was extremely spotty germination and not nearly enough fall crucifers. 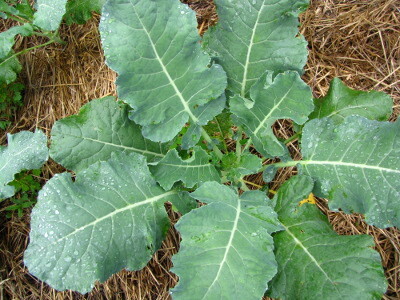 Although it was a bit late by the time I noticed the problem (the beginning of July), I went ahead and moved on to plan B --- start broccoli and cabbage in flats where I know I can get them to come up, then transplant into the garden just as they get their first true leaves. 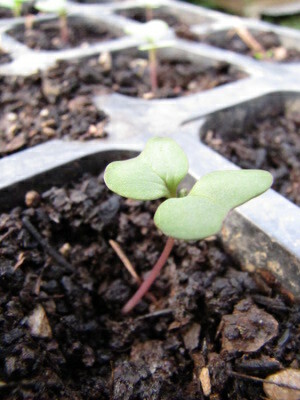 It turned out that my broccoli seeds had low germination even there, so I ordered another batch and tried again. This last round of seeds will have to be protected by quick hoops if I want them to head up, unless we get a late killing frost the way we do some years. I seem to gamble with broccoli a lot, and sometimes it pays off. I got spooked by our constant rain in the middle of May and planted a bed of broccoli as a consolation prize if the blight took our tomatoes. So far, our tomatoes are in good shape, but so are my summer broccoli! I guess we'll have some fall broccoli no matter what happens with my late seedlings. Been following your blog since the beginning of the summer. Thanks for the knowledge dumps. I've found that certain seed companies have better germination rates than others. Dunno if you are working from saved seed or not, but I've noticed that Renee's Garden consistently has the best germination for veggie and flower seeds. Course, they're targeted towards the home gardener with only a few raised beds, so buying packets of seeds for a yard your size can get expensive. Also they are based out here on the west coast, so I don't know how the varieties would behave out your way. Secondly I wonder why you didn't go with a jet pump? They're designed to lie down horizontally in shallow water...? I got most of my seeds this year from Johnny's, which has a good reputation and served me well on everything else. I suspect this was just a dud batch (or a variety of broccoli that doesn't like germinating in heat.) I decided to try them out because I wanted to try varieties that Eliot Coleman recommended for fall gardens, and he's connected to Johnny's in some way so they have all of the varieties he recommends. On the other hand, I did move away from Jung because of too many dud batches! We considered a jet pump, but decided against it because the pumps aren't submersible and are designed for indoor use. In a shallow well, that's not a problem, but if you're pumping from an outdoor water source and a have a high elevation to deal with, you'll lose pressure really fast with non-submersibles. It's much easier for a pump to push water than pull it, so having to pull water up into the pump even a few inches drastically cuts down on efficiency and on how far uphill a certain horsepower pump will be able to then push that water. Since our creek floods, we'd have to put a jet pump at least eight feet above the water surface to make sure it stayed dry all the time, and that would mean we wouldn't have enough power to run the sprinklers once the water line ran a few hundred feet horizontally and about twenty or thirty feet vertically up to our garden. We also would have had to design a waterproof but well ventilated casing to protect the pump, and we were desperate to get our irrigation system back up and running ASAP!